Surveying and mapping the River Severn from the City Bridge to the new footbridge to raise awareness of a new cycle network and riverside walk. As part of a wider project Tranquility is a State of Mind [Liminal] and part of Sustrans' Connect2 Big Lottery project. Assisted by students from the University of Worcester completing a work placement programme. Initially to support Liminal's Tranquility is a State of Mind project and the installation of the Organ of Corti, the project aimed to investigate to the idea of 'tranquillity' or the 'bucolic' in relation to the changing character of the riverside. 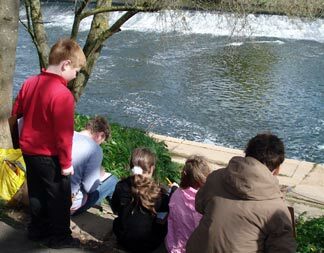 Research into the canalised riverbank and the 19th Century Diglis weir led to a re imagining of the sketching trips of Severn river engineer and amateur painter Edward Leader Williams and his young son Benjamin Williams Leader (Benjamin grew up to be Worcester's best known landscape painter). This tension or blurring between 19th century engineer and artist and the imagining of conversations between adult and child became central to the investigation. "Here on the bank of the river the motifs multiply, the same subject seen from a different angle offers subject for study of the most powerful interest and so varied that I think I could occupy myself for months without changing place by turning now more to the right, now more to the left." To find a tension between spontaneity and limitation, Bromwich Parade path was marked every twenty feet - a scale found on an Edward Leader Williams drawing for works to the river bank adjacent the cathedral. 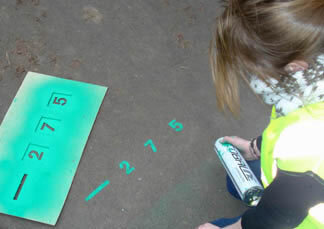 Markings were made with temporary survey marking paint. Distances were measured with a home made trundle wheel. The scale seemed appropriate to explore 'every inch' of the river during the time period of three months. Walks with groups and individuals then followed. Emphasis was made on recording as an artist, with the use of a viewfinder, which also became a prop to induce conversation. However sound became as important as visual observation and stories from schoolchildren became as meaningful as those from archaeologists, between two hundered and seventy five marks. It became apparent that these conversations between myself (as artist) and others became the richest source of content. Drawings, photos and other writings from individuals became equally as important material to reinforce the conversation material, and locate what was said whilst building a map of the activity. Echoing Benjamin Leader's methods of later refining his sketches in to a painting and his father's surveys of the conditions of Worcester, all the snippets of conversations were refined into lines of text. The result is a kind of 'prospect map' ( maybe a reinterpretation of 18th perspectives of the city from the same bank) or a documented story of this exploration, that might be used to inspire others to continue to find meaning of the river to the city. As one voice said on a river walk.. "Any landscape is art isn't it? it doesn't necessarily have to be painted". Perhaps that simple statement echoes or enforces 'art as experience' [Dewey], collective exploration and ideas sharing as place shaping activity. 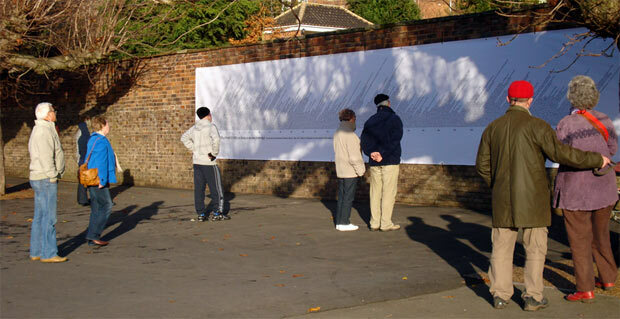 A temporary installation of the full scale '20ft to an inch' map was launched at Diglis on the 25th November. 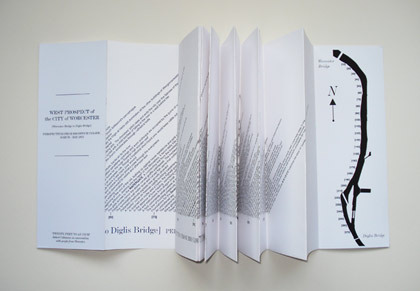 The text at 72pt meant that each line of text represented twenty feet of river. First draft copies of a concertinaed fold out map/poster were also printed at 12pt or '20ft to one sixth of an inch'. This can be downloaded below. Should any suitable permanent location be found, the map can be interpreted with any permanent sympathetic typeface and material, to aid wayfinding.